With a sudden wind, Springtime has waltzed herself over the hills and into the valley where our home sits. She has passed through the magnolia near our house, pink-tinged buds waiting for just a moment more of encouragement from the sun. Fields seemingly shifting from brown to green overnight. Springtime has charmed even the wildflower seeds brought from my family home in downeast Maine last autumn and doubtfully planted when the snow first melted a month ago, garish orange tiger lilies and lavender lupines that render me homesick at the very thought. With her palm to the ground, Springtime has persuaded those precious seeds to crack their husks and send out tender roots and sprouts. What a startling contradiction plants are: fragile enough for even a child to pluck and snuff out, yet possessing the power to crack boulders and consume man’s mightiest designs. We have had several warm, sunny days in a row, which has set me thrumming. It is incredible how the hint of spring sends us all into a fervor of motion. The whirl of kinetic energy outside is infectious. 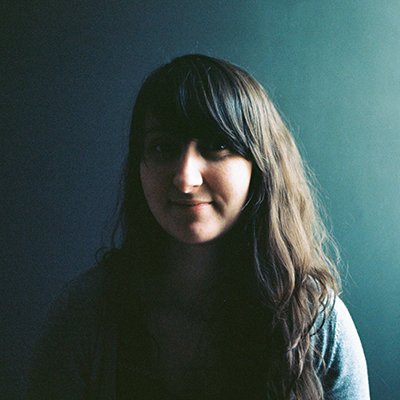 It seeps through our windowpanes and slips under our doors. The rush of green into the countryside was unable to slow itself before the walls of my house, and so my bench is dripping with green, as well. The energy of birds frantically gathering twigs for their nests has me quickly sketching new designs. There are grackles nesting under the eave on the northside of the house, and I can hardly keep myself from tossing open the window each morning and calling out to them. 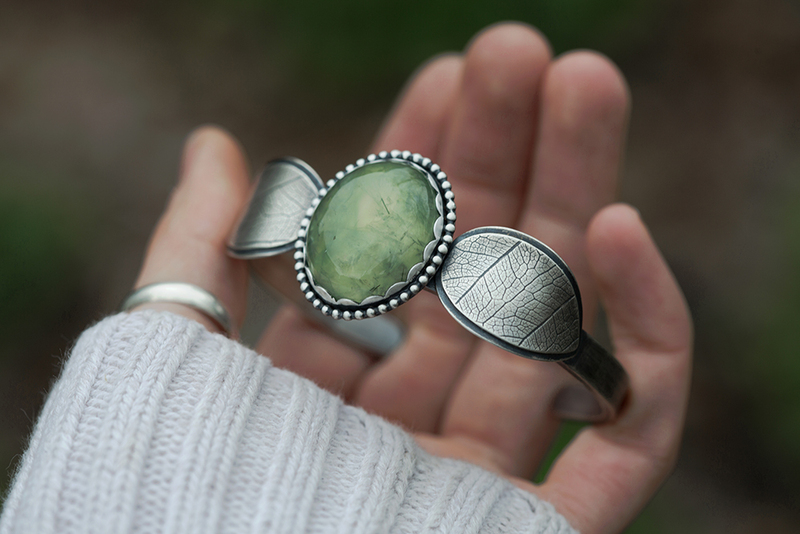 I feel as though I could soak up this green energy and have it carry me through any amount of gray rain without slowing, bowls of light sitting upon my bench and leafy gemstones waiting to be set. With Springtime resting her hands upon my shoulders and imbuing me with vigor, I have been a blur of movement in the studio! 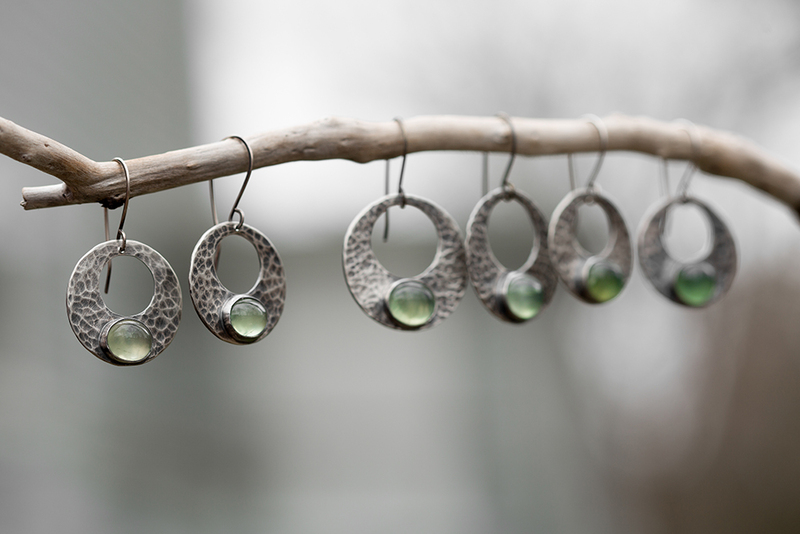 Each spring, I create a new version of my Mossflower Collection. 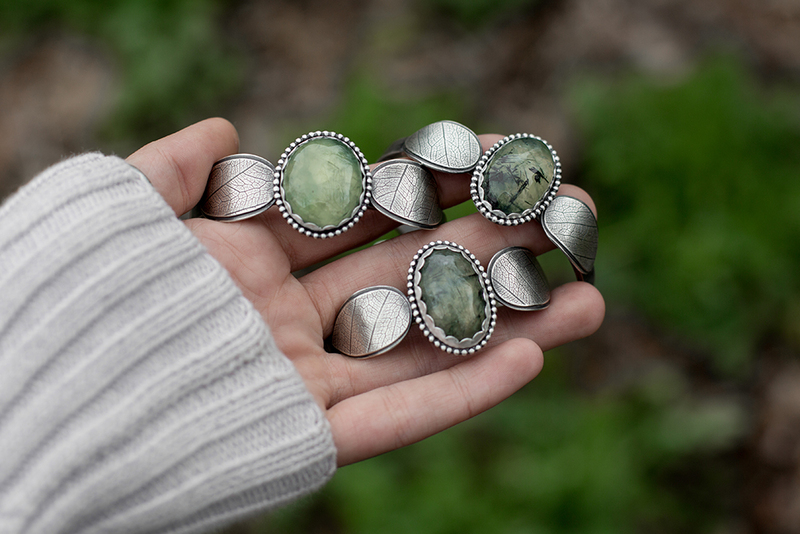 I choose stones that reflect the delicate green of new growth and the warmth of springtime. 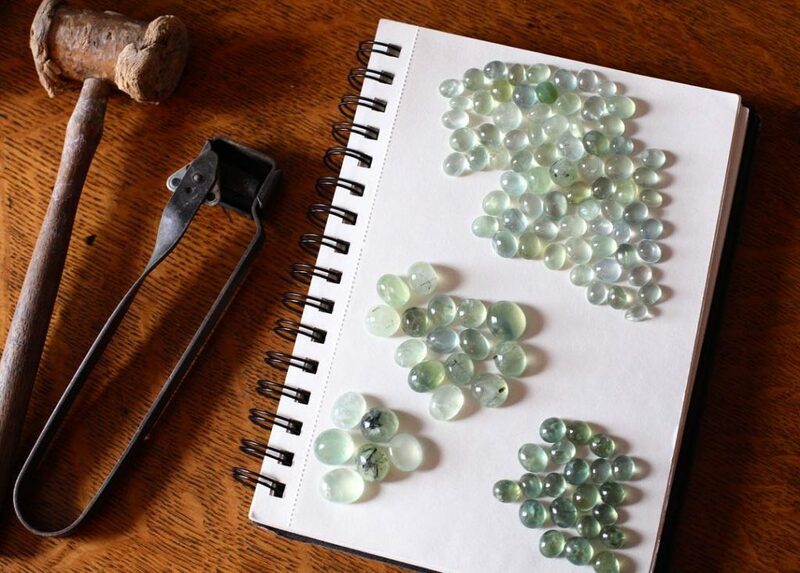 Prehnite encapsulates this season for me, swirls of soft green and tiny, dark rutile shoots throughout the stones. I have been working tirelessly at this year’s iteration. 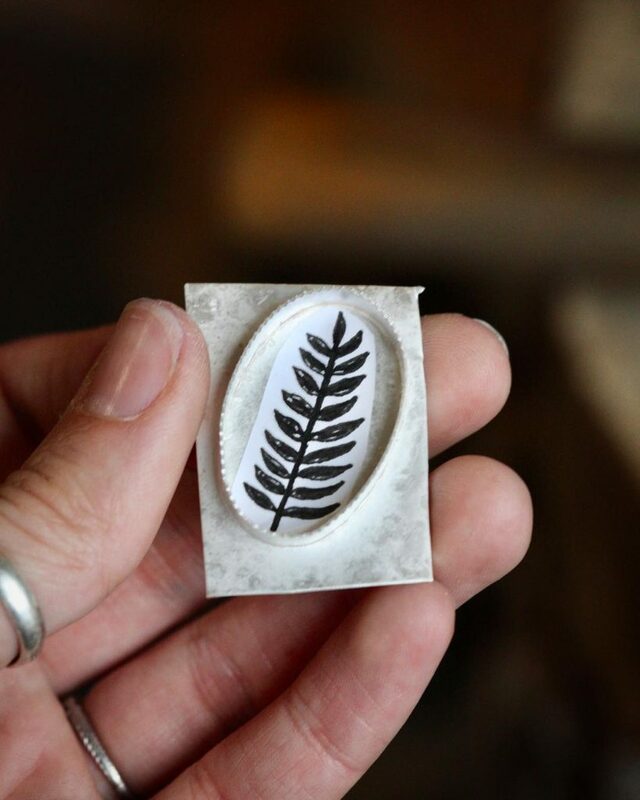 Light and warmth pouring out of my hands to coax ferns out of sterling silver, encouraging them to unfurl. I have been hammering texture into the surfaces to reflect the rough uniformity of bark and stone. 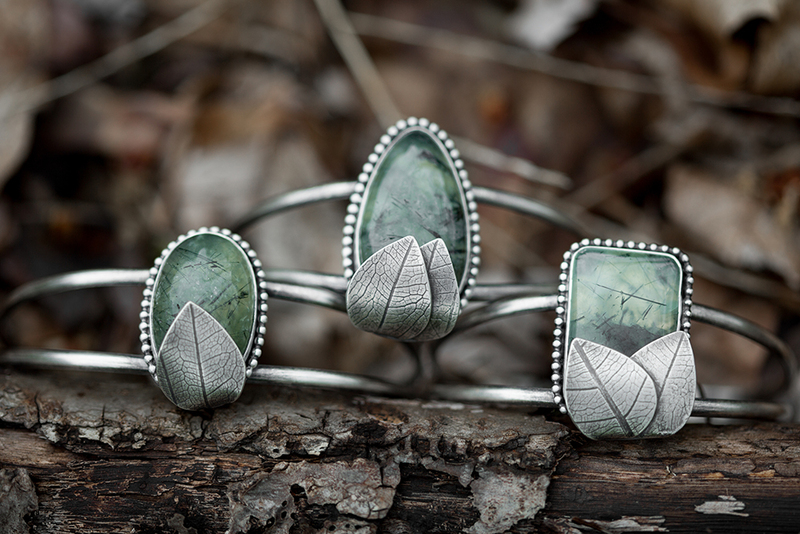 Layers of sterling silver stacked like the accrual of past growth and decay, each leaf springing up out of the detritus and then falling back upon its forebears to give way to next year. This collection will be a large one. 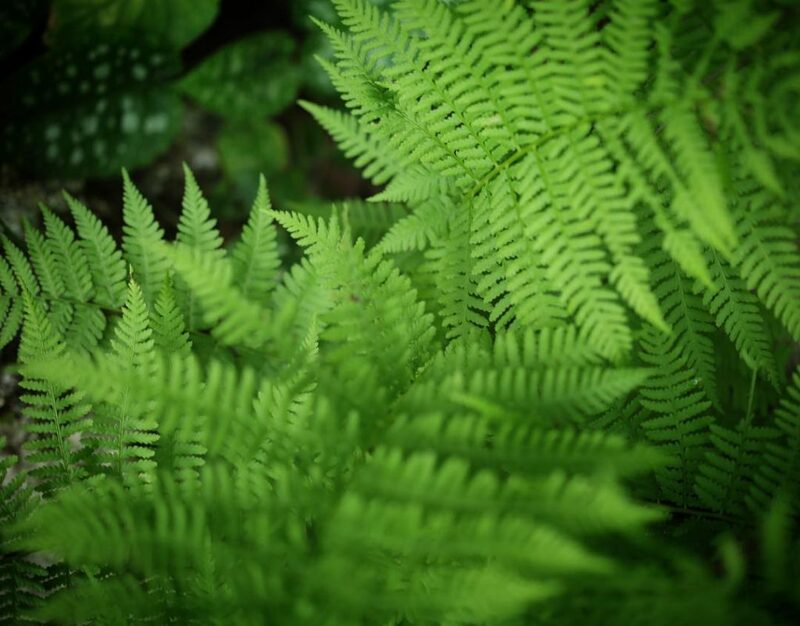 Similar shapes and patterns of springtime will be repeated throughout all the pieces, but each design unique, comparable to how a forest may appear homogeneous at a distance, but every plant and flower distinct upon closer inspection. 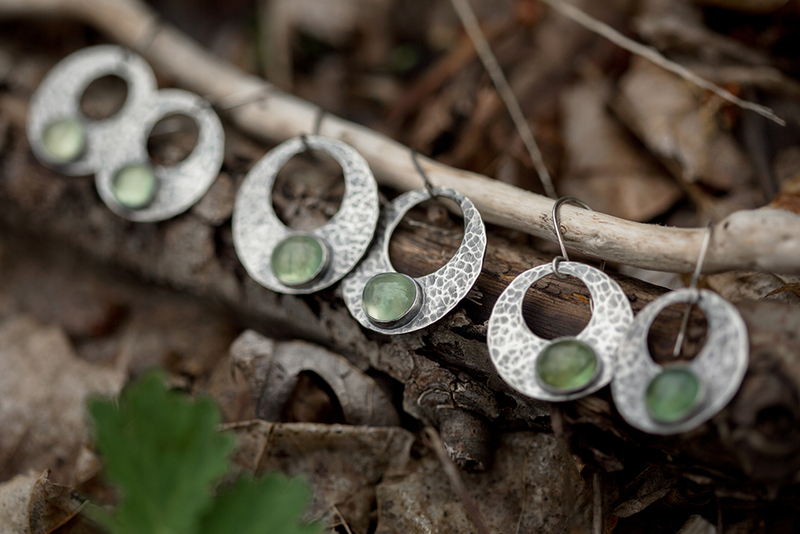 And so, here is the first preview of this year’s Mossflower Collection. These are the first pieces to emerge from torch flame and coping saw, natural and uncomplicated. 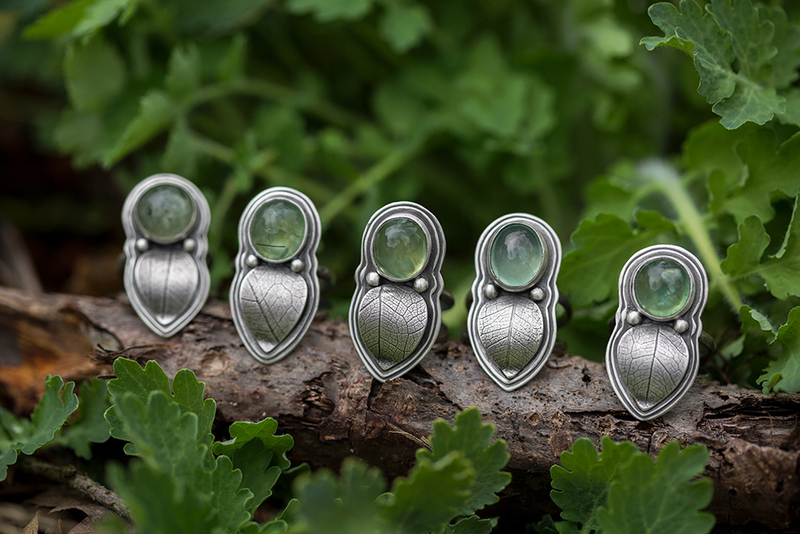 While creating these pieces, I have also had The Silmarillion by J.R.R. Tolkien on my mind, particularly the story of Yavanna and Aule. But I will speak more to that in the next preview. 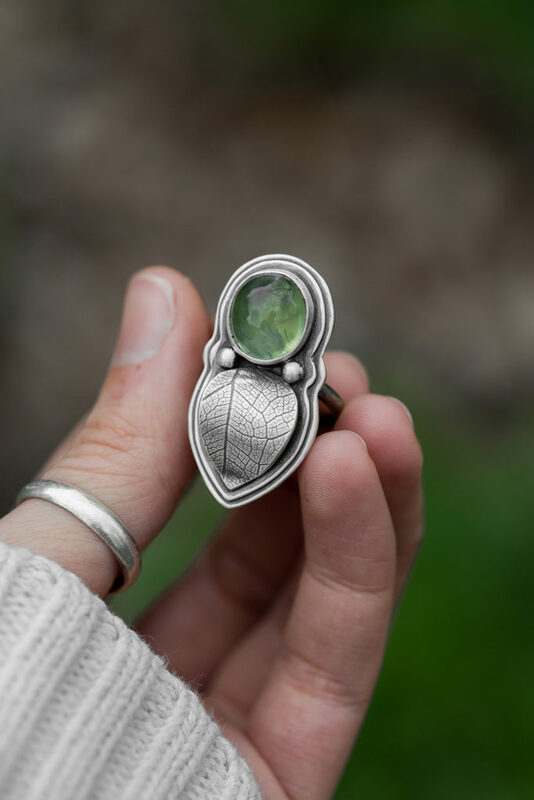 Check back here and on my Instagram for more previews, as well as a date and time announcement for this collection’s shop update. 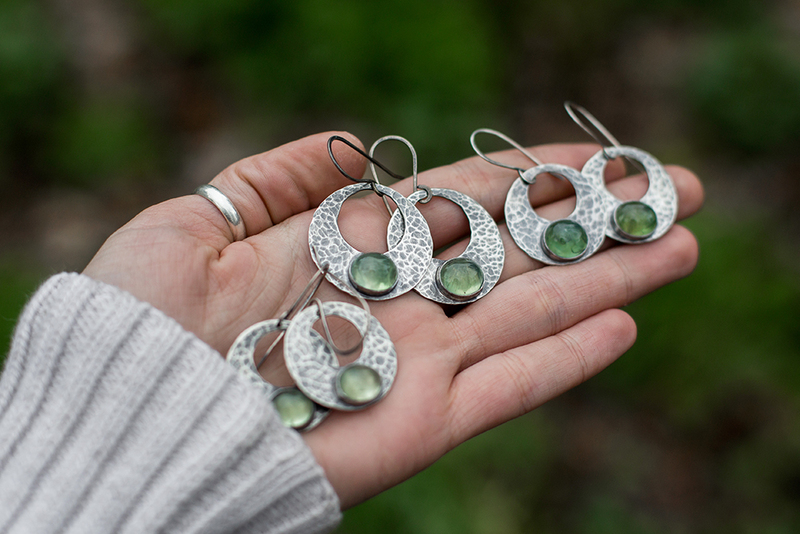 I hope you are gathering up all the light and green of springtime to tuck in your pockets as I am!